Because there is no elevator to success. You have to take the stairs. Both running and stair climbing are great exercise routines. Running and stair climbing have aerobic benefits and tone muscles in the legs and buttocks. However, stair climbing affords many more benefits than running or walking. 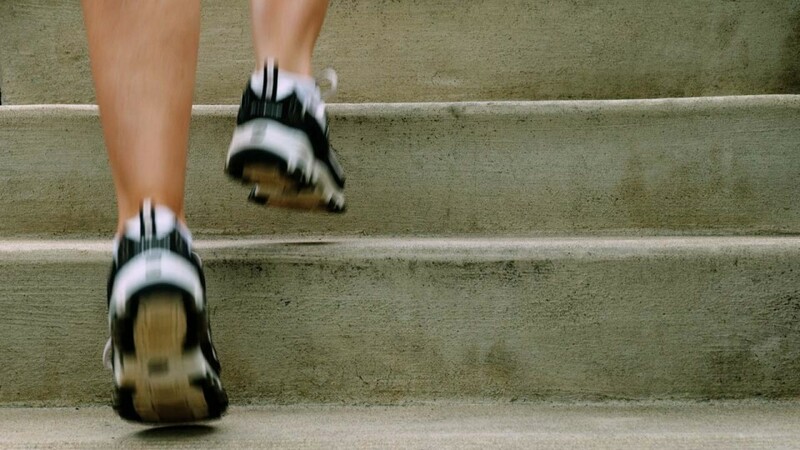 Stair climbing builds muscles in the lower body and burns calories. 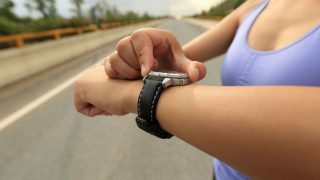 When walking and running, your body moves in a horizontal pattern. 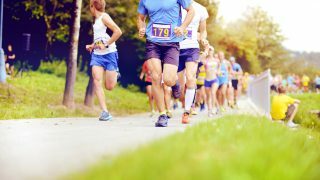 With running, your body does experience slight vertical movement. However, with stair climbing, your muscles are forced to resist gravity and move in a vertical pattern. When you move your body vertically, you place high demands on the lower body. Your leg muscles must repeatedly lift your body against the pull of gravity. In addition, your muscles must stabilize and balance, which puts even more demand on the muscles in the lower body. Stairs are generally readily available. Those who run for exercise generally prefer to have a span of distance over which they may travel. Stairs, on the other hand, are readily available in apartments, office buildings, on streets and in public areas. Stairs are “compact.” Those who prefer stair climbing to running simply need an ordinary staircase for their workout. In fact, all buildings that have elevators also have stairs. Those who prefer to stair climb for exercise may opt to take the stairs instead of the elevator when faced with this choice. In addition, stair climbing requires no special clothing or equipment. You may want to wear comfortable workout clothes and shoes, but even if you are not dressed for a workout, you can still reap the aerobic and fat-burning benefits of stair climbing. When you stair climb for exercise, you burn twice the fat in half the time than if you run and three times more than walking. An intense stair-climbing exercise session will produce more aerobic benefits in a shorter amount of time than running or walking. One hour of stair climbing will burn approximately 1000 calories. Those who walk or run for exercise rarely do so in harsh weather or rain. On the other hand, weather need not become an issue for stair climbers. Indoor staircases are plentiful so weather is not as much of a consideration for those who choose to stair-climb for exercise. Stair climbing exposes the legs, ankles and knees to less pressure from impact than running on concrete. Running places a considerable amount of pressure on the feet, as well. Stair climbing offers the benefit of less impact to the body while reaping more aerobic and muscle-building benefits. Both running and walking burn calories and have aerobic benefits. However, those benefits may greatly increased with stair climbing. The calorie-burning and aerobic benefit of stair climbing is determined by how vigorously the activity is pursued. If you casually walk up the stairs, the calorie-burning and aerobic benefits are only slightly higher than running or walking, but if you expend some effort and energy, quickly moving up the stairs, the benefit is greatly enhanced. Experts recommend that when you begin stair climbing for exercise, you start out slow. 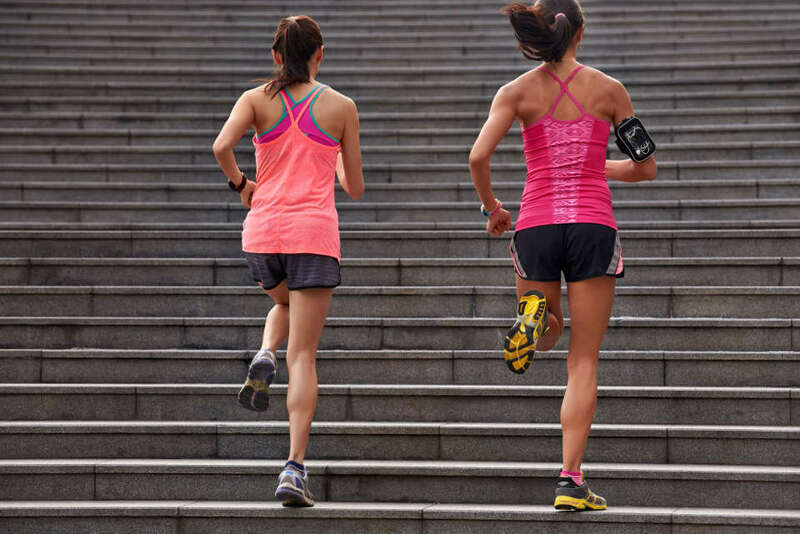 Start with 10 minute sessions three times per week of stair climbing and slowly build up to more time as your endurance increases. When you first begin stair climbing for exercise, pay attention to any pain that you may experience in the knees, back, hips or ankles. Over time, build up to 30 minute sessions of stair climbing to reap the most benefits from stair climbing for exercise. Start your stair climbing routine by first warming up for five to ten minutes. Though walking slowly up and down the staircase will provide the necessary warm up, you should simply walk or do a few jumping jacks to prepare. After all, you will be faced with overcoming the psychological barriers you face with the staircase. Performing a different activity for your warm-up will help you mentally prepare for your stair-climbing exercise session. 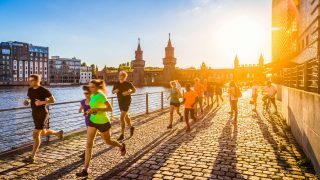 Those who run for exercise know the value of an intense run, as do those who are attempting to enhance their fitness through cardio activities. 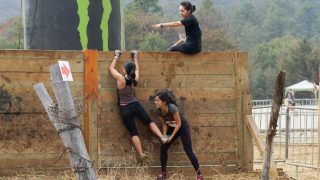 There are several reasons why a runner would incorporate stair climbing and stair running into their exercise routine. 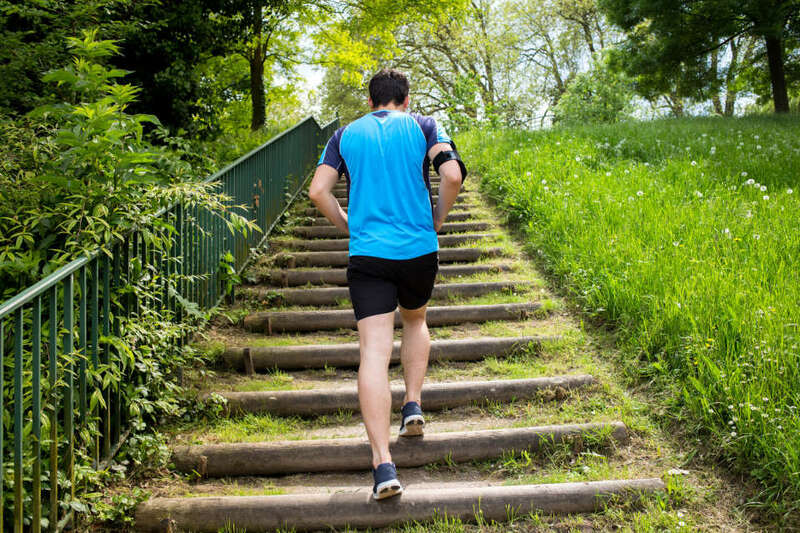 Stair climbing is a great way to cross-train if you are a runner. 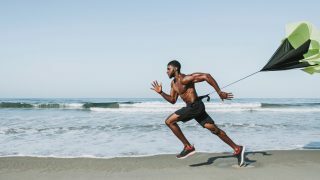 A major purpose in cross training is to increase aerobic activity by using muscle groups that are not utilized when running. Stair climbing targets the gluteal muscles and quadriceps. By strengthening these muscles, you will increase power and strength for running. Even though no special equipment is required for stair climbing, several stair climbing exercise machines are available that are convenient and compact. If you prefer another form of exercise, such as bicycling or running, stair climbing is a great way to cross-train and place demands on different muscle groups. Stair climbing is quickly growing in popularity as a convenient and fast way to stay fit.